On Tuesday, January 30, 2018, moments before President Donald Trump gave his State of the Union speech - the report of his first twelve months in office - a group of undocumented young people walked the corridors of Congress to take their place in the guest seats. Denea Joseph, Esli Becerra, and Adrian Escarate were names unknown to those present, but senators and representatives like Kamala Harris, Ron Wyden and Carlos Curbelo (known to all) decided that on that special day, this group had to be there. Since he began his campaign for the presidency, Trump used immigrants as bait to attract voters - conservative, angry, or hit by the economic crisis of 2009. In a speech of nationalist exacerbation, the unexpected Republican candidate resorted to the hackneyed trick of putting part of the blame for all the crises - financial, labor, security - on immigrants who for years, sometimes decades, have lived in the country without documents. And of those, the group that has best served Trump for political bargaining has been the Dreamers. “Dreamers” is a term used to describe undocumented youth who came to the United States as minors, and who have spent most of their lives in this country: here lives their family, their friends, their identity. They are Americans in almost every way, except on paper. 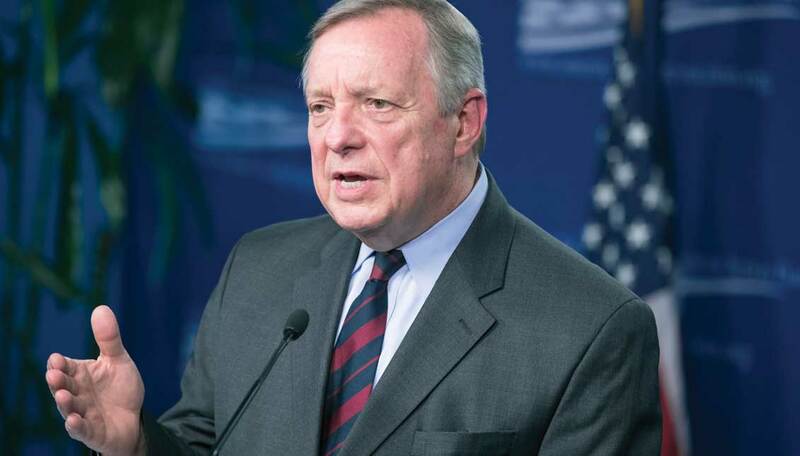 In 2001, Senator from Illinois Richard Durbin presented to Congress an initiative - Development, Relief and Education for Alien Dreamers, or the DREAM Act - which, under some requirements (having arrived in the country before the age of 16; were under the age of 31 on June 15, 2012; among others) would regularize the migratory status of these children. The name, of course, had strategic symbolism; potential beneficiaries of the law began to be known as Dreamers. It has been 17 years and the bill has not been passed. Durbin, today a man in his seventies - white skin, gray hair and a friendly smile - continues to be the main promoter of the migration regularization of these young people who bear their destiny in their nickname. While the White House describes immigrants as rapists, drug dealers or gang members, the word “dreamer,” a positive connotation associated with the identity of the United States, is exceptional in political discourse. In the first days of January, Durbin and 24 other members of Congress invited these young people to President Trump’s speech to demonstrate the need to regularize the immigration status of the nearly two million others who, like them, could be beneficiaries of the DREAM Act. In 2010, the possibility of the dream becoming reality was closer than ever. For the fifth time since Durbin introduced the initiative, the DREAM Act was discussed in Congress to be voted on. At that time there were already many young students in universities grouped under “Dream Teams,” associations of undocumented students who exchanged information to access financial support to study - which is denied to those who lack a social security number- and to advise each other on immigration status issues. Two years earlier, taking advantage of the emergence of social networks such as Twitter and Facebook, many of these groups connected with one another to create a national network in support of the presidential candidacy of Barack Obama, who expressed his resounding support for the DREAM Act. Despite the fact that they could not vote due to their lack of citizenship, in 2008 these young people joined the so-called “Obama armies” to motivate the vote by knocking door-to-door. The practice was very useful for them; when the time came for the legislative debate two years later, they used the network they already had to do political lobbying in Washington. The Dreamer movement was born. That same year, in July 2010, I conducted an interview with Brian de los Santos, a journalism student about to turn 20, who was pursuing a career in journalism at California State University Northridge (CSUN). We met on campus to talk. He was a tall, slender young man, with white skin, black hair, and a sharp face, whose expression had a hint of nostalgia. Originally from the Mexican state of Veracruz, Brian’s family migrated to seek a better life when he was two years old. Without sadness and without resentment, he told me about his first years in the United States: growing up like any other boy, but being prepared for the worst because he did not have documents. He told me that he was listening to his parents talk about Veracruz, but he was unable to feel that place was his. He lived feeling inferior, seeing his friends driving cars or traveling to other countries while he didn’t have the money to study. He told me that he had support from his parents, that he managed to get a job, but that every day was a struggle to go to school. I asked him what would happen to him after his graduation. In December of that year, the DREAM Act was approved by the House but lost by five votes in the Senate. The proposal was crushed for therest of the Obama administration, and the young people understood that. If the doors were being closed from the government institutions, they would seek to enter from another side. The streets of some of the main cities of the United States are similar: wide avenues that allow the uninterrupted circulation of hundreds of thousands of people who rarely stop to look. Until someone forces them to. During the summer of 2010, and in the months following the defeat of the DREAM Act, Washington DC, Los Angeles, Montgomery and Phoenix, among many other cities, were surprised by groups of activists who blocked the streets and were arrested, with risk of deportation, to draw the eyes of the media and the people: if the government didn’t see them, they would make the rest of the country pay attention. 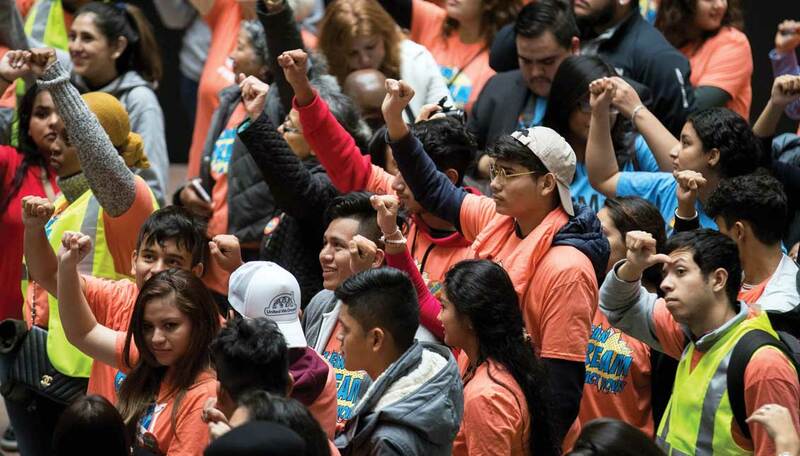 The strategy worked and today, ten years after the first Dreamers networks were created, this is undoubtedly the most important activist movement in the United States. Its slopes range from protest and disobedience to direct lobbying. Some groups focus on access to higher education while others demand political solutions. Some reject the term “dreamer” because, they say, it creates a subcategory for other immigrants, like their own parents. There are intersectional groups, such as the undocuqueer and undocublack movements, and from Hollywood to the union movement there is support for these guys. One of the results of Dreamer activism was the Deferred Action for Childhood Arrivals program (DACA). In June 2012, a few months before the election to his second presidential term, Obama announced this measure that, under criteria similar to those of the DREAM Act, grants children a temporary social security number and temporary work permit, with the possibility of renewal but susceptible to be revoked at any time. The measure sought, the president explained, to protect young people while Congress resolved their situation in a definitive manner. The legislative agreement did not arrive. There are nearly 800,000 DACA beneficiaries who are currently studying and working thanks to the program, but who, with the arrival of Trump, are living in distress: in September 2017 the president said that the measure would be canceled in six months and gave an ultimatum to Congress to approve a DREAM Act. In the following months Trump has tried to negotiate the future of the Dreamers in exchange for funds for border security, but a couple of federal courts have ordered the continuity of DACA. 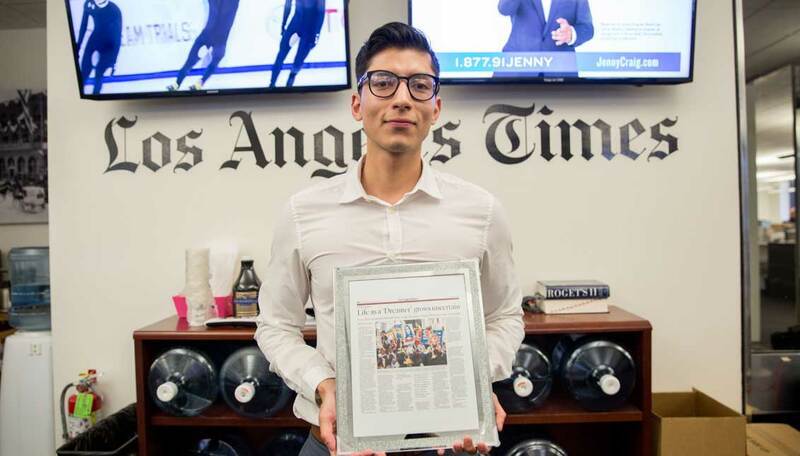 In October 2017, after Trump’s announcement, Brian de los Santos wrote his story and it was published in the Los Angeles Times. years seemed like a distant threat - losing my job, being sent to the country I left behind when I was so small - suddenly feels close to real, again,” he wrote. “Do you remember when we met?” Brian asked me during a recent conversation. Since 2010, he has become a man of athletic appearance and pleasant presence, capable of leading several projects at the same time. “Back then I didn’t know what would happen to my career or my life. When DACA was announced, I was finally able to imagine myself living in the United States and doing something with my career; it made me feel stable, trusting in my professional experience, in who I am. I even started telling people that I’m queer; I felt that somehow, now that I had protection, I could really, really, really be myself,” he said with satisfaction. At 27, Brian has demonstrated what a talented young man can do if he has the tools. He has worked at NPR and its affiliate stations, and in July 2015 received the LA Times offer. He is a member of the board of directors of the National Association of Hispanic Journalists (NAHJ), and in February of this year he accepted a new challenge coordinating the digital strategy of the Desert Sun newspaper in Palm Springs. Remembering what he told me eight years ago about what would happen if the DREAM Act was not approved, I asked what will happen now if the DACA protection is terminated. He breaks a relaxed laugh. The work permit that Brian has thanks to DACA expires in November 2019. *EILEEN TRUAX is a Mexican journalist specialized in Migration and Politics. She's the author of "Dreamers, an immigrant generation's fight for their American Dream". She lives in Los Angeles.